FREDERICK, MD-On Friday morning, the Baltimore Orioles announced their minor league coaching staffs for the 2019 season. Ryan Minor returns as the Manager of the Frederick Keys for the 2019 season. He will be joined by a pair of new faces in Justin Lord, who begins his first season as Pitching Coach and Bobby Rose who enters his first year as the Keys Hitting Coach. Adam Bleday comes on board as a Development Coach, while Marty Brinker (Athletic Trainer) and Gene Escat (Strength and Conditioning Coach) reprise their roles from the 2018 season. 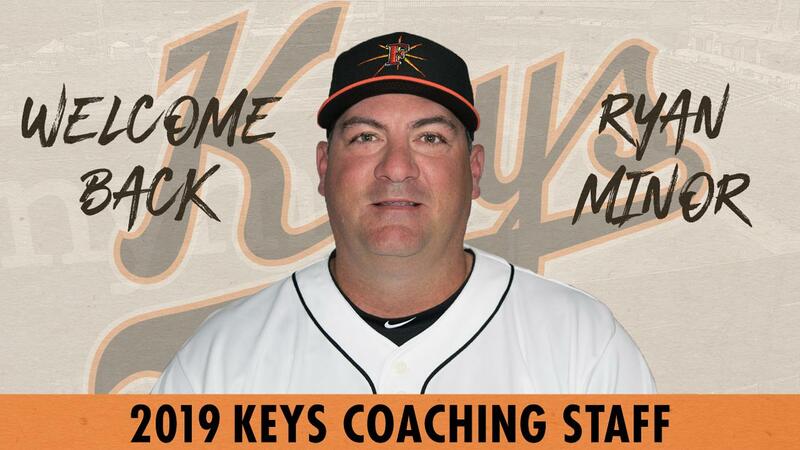 Entering his third overall season as Keys skipper, Minor, 45, also begins his 12th campaign as a coach or manager in the Orioles minor league system. His second straight year as Frederick's manager, he led the team to a 65-72 finish in 2018. Prior to last year, Minor served as the Keys field leader during the 2013 season. Originally drafted by Baltimore in the 33rd round of the 1996 draft out of the University of Oklahoma, Minor spent parts of three seasons with the Orioles (1998-2000) as well as one season with the Montreal Expos (2001). He may be best remembered for taking Cal Ripken Jr's place at third base on September, 20, 1998, the night Ripken ended his consecutive games played streak. Minor also enjoyed a stellar basketball career at Oklahoma. Earning Big 8 Player of the Year honors during the 1994-95 season, he was selected by the Philadelphia 76ers in the second round of the 1996 NBA Draft. Lord, 39, joins the Frederick coaching staff after spending the previous two seasons with the Low-A Delmarva Shorebirds. Entering his seventh overall season on the Orioles minor league staff, Lord also served as the Shorebirds pitching coach in 2013 and held the same role with the Short-Season Aberdeen IronBirds from 2014-16. In 2018, he led the Shorebirds pitching staff to a 3.39 ERA, the third-best mark in the South Atlantic League (out of 14 teams). Originally signed by Kansas City as a non-drafted free agent out of Florida State, Lord pitched three seasons in the Royals and Pirates systems. This included Carolina League stints with the Wilmington Blue Rocks (2003) and the Lynchburg Hillcats (2004). Lord also pitched three years with the independent St. Paul Saints. Like Lord, Rose, 51, comes to the Keys staff after working in Delmarva during the 2018 season. His second season on the Orioles minor league staff, the California native previously spent five years as a hitting instructor in the Texas Rangers organization. This included time with the Carolina League's Down East Wood Ducks in 2017. A fifth round pick by the California Angels in 1985, Rose made his MLB debut with the Angels in 1989 and spent parts of four seasons in the majors (1989-92). Following his time with the Angels, Rose enjoyed an impressive career in Japan with the Yokohoma BayStars and the Chiba Lotte Marines in the Japanese Central League. His best season came in 1999 when he batted .369 with 37 home runs and 153 RBIs. Finishing the year with 192 hits, Rose established a Central League record at the time. The 2019 season marks the first professional coaching stint for Bleday, 24, who spent the previous two seasons as a pitcher in the Astros minor league system. Originally selected by Houston in the 27th round of the 2017 draft out of the University of Pennsylvania, Bleday pitched across four different levels in the last two years. This includes a seven-game stint with the Buies Creek Astros in 2018. Brinker, 29, begins his fifth year in the Orioles system. Before joining the Keys as the team's trainer in 2018, he spent 2017 with Delmarva and the 2015-16 seasons with Aberdeen. He also worked as a trainer for Army West Point football as well as the University of Akron and the Mahoning Valley Scrappers (Indians Short-Season). Brinker received his bachelor's degree in athletic training from Capital University and his masters degree in exercise physiology/adult fitness from the University of Akron. Escat, 29, goes into his third season as a strength and conditioning coach. In addition to holding down this role with Frederick in 2018, he pitched for the Keys in 2013 and 2014. A 23rd round pick by Baltimore in 2012 out of Fresno State, Escat climbed as high as Triple-A Norfolk. He concluded his career in 2016 after spending time with the St. Paul Saints and in the Mexican League. Kent Qualls begins his seventh season as the Orioles Director of Minor League Operations. Chris Holt enters his first year as the Orioles Minor League Pitching Coordinator, Jeff Manto returns as Hitting Coordinator, while Dave Anderson and Don Werner continue their roles as Infield and Catching Coordinators. The Keys are excited to host the 2019 Carolina League All-Star Classic on Tuesday, June 18 presented by Visit Frederick. The Keys schedule for next season is available by clicking here, while fans can buy/renew ticket plans for the 2019 season by calling 301-815-9900. All plans come with the choice of a Keys all-star game hat or a Ryan Mountcastle bobblehead. To follow Keys offseason news, events and more, fans can visit frederickkeys.com.